In a property of 4 hectares, stay in a beautiful suite of 88 m2 on the ground floor of villa with heated pool (This is the only rental on the property). -The entrance is private (you are at home). Located in the countryside and only 2 minutes from the village of Valensole, this suite is ideally exposed south with a clear view and not overlooked. - a fully equipped American kitchen (recent electric oven, hob, hood, microwave, fridge-freezer, dishwasher, washing machine) and all the necessary to cook (stoves, pots, etc ...), electric grill. - A dining room furnished with buffets, tables, chairs in Provencal style. Nespresso coffee machine, filter paper coffee machine, tea, toaster, citrus juicer, etc. - an air-conditioned living room with a large screen LED TV, a recent sofa, armchairs, coffee tables and a magnificent aquarium. - a large room of + 20 m2 composed of a large bed 160X200 with recent bedding, a bed 90X190, a dressing room, a wardrobe. - A bathroom with hydromassage and light therapy bath, a large walk-in shower and a sink. 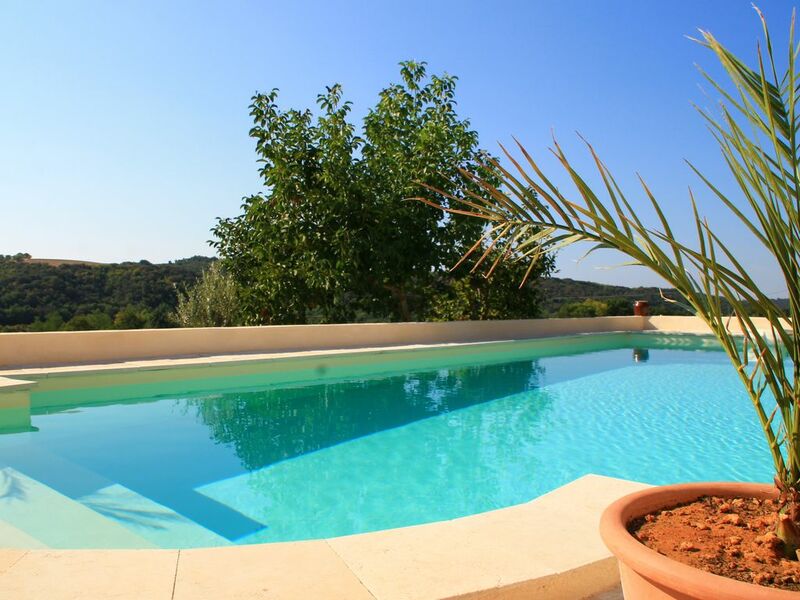 - The heated swimming pool of the owner (10.5m X 4m) is at your disposal. A large terrace is located around the swimming pool with deck chairs, tables, chairs, fitness equipment, table football, barbecue, outdoor shower, WC. Contact the owner to make a personalized quote. The suite is non-smoking and our pets are not allowed. The entire property is under video surveillance and has a caretaker. A check of deposit of 700 euros will be asked at your arrival (not cashed). An inventory of fixtures will be made on your arrival and your departure, There is no "cleaning fee". Nevertheless, a cleaning lady can intervene at your expense. You must leave the rental as clean as it was when you arrived. Otherwise, the corresponding cleaning costs will be retained on your deposit. The owner lives in another part of the villa, with a separate entrance and terrace. You will be calm while being able to count on him to inform you. GREOUX LES BAINS is 8 minutes away. The Gorges du Verdon, Lake Sainte-Croix and the famous village of Moustier-Sainte-Marie are 30 minutes away, Lake Esparron is 15 minutes away. Digne les Bains (the prefecture of the Alps of high Provence) is at 40 minutes. Roland is native of Valensole and he will be happy to give you the good addresses of the region. The property is located in the countryside, surrounded by fields of truffle oaks, poppies and lavender. At the gates of the Verdon gorges and near the lake of Sainte-Croix, the walks will be pleasant. Bathroom with tub, walk in shower, whirlpool tub. toilet. Near the pool, outside, a toilet and a shower are available. A spacious, well equipped property. This is a quiet rural property. It is extremely clean and well equipped. We had a restful holiday. Roland was a friendly, helpful, available, but not intrusive, owner. The location is convenient for the Verdon gorges and the nearby lakes. We are very happy with this Villa. Roland, the owner, is very nice and helpful. We arrived on a bank holiday in France which meant that all stores were closed and we couldn't buy any food for our dinner the first day. He offered us some fresh egg from his hens and home made apricot jam. The house is very clean and cozy. We enjoyed the pool every single day as well as the hidro massage bath :). It is situated in the middle of the country side which gives you so much peace. Laying by the pool listening to the nature is the best highlight of our trip. J'ai été très heureux de vous recevoir. Je suis ravi que vous ayez apprécié votre séjour chez moi. Excellent séjour dans ce gîte confortable, conforme à la présentation du site. Accueil agréable par un propriétaire disponible et discret. Gîte bien équipé, environnement calme sans voisinage proche. Belle piscine chauffée, région magnifique. Tous les ingrédients sont réunis pour des vacances mémorables. We have been very hospitably received by Roland and his wife. There was a nice Provencal gift ready for us. Roland was very attentive by helping us when we had questions. We very much enjoyed the pool and hydro massage bath. The appartement was very clean. A great base for trips to Gorges du Verdon, Aix en Provence, Orange and Avignon. We would like to come back again. We zijn erg gastvrij ontvangen door Roland en zijn vrouw. Er stond een leuke Provencaalse attentie voor ons klaar. Roland was zeer attent door ons te helpen wanneer we vragen hadden. We hebben erg genoten van het zwembad en het hydro massage bad. Het appartement was zeer schoon. Een prima uitvalsbasis voor uitstapjes naar Gorges du Verdon, Aix en Provence, Orange en Avignon. Superbe location aux portes de Valensole, avec ses champs de lavande à perte de vue. Confort exceptionnel pour ce logement en rez-de-chaussée, climatisation, piscine à température constante de 28°. Bref un lieu où il fait bon se retrouver après une journée de balade sous la chaleur estivale dans les différents sites touristiques du secteur. S'agissant de l'accueil, je dis "chapeau". Sympa, chaleureux, prévenant, le propriétaire est très attentif à la bonne qualité du séjour de ses locataires. Nous avons beaucoup apprécié. Et bien que ce soit indépendant de sa volonté, (mais nous avons beaucoup aimé), tous les jours en fin d'après midi, vers 19h00, nous avions la visite d'un écureuil qui venait s'approvisionner dans le noisetier proche du logement. Une belle surprise. Bref, une adresse que nous n'hésiterons pas à recommander.